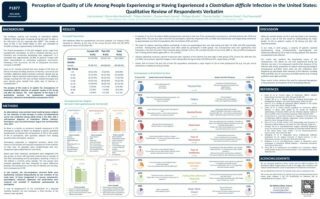 The poster entitled “Perception of Quality of Life Among People Experiencing or Having Experienced a Clostridium difficile Infection in the United States: Qualitative Review of Respondents Verbatim” will present the key results of a quality of life survey conducted among 350 US patients with C.difficile infection. The presentation will be done by Paul Feuerstadt, MD, Principal Co-investigator of the study. Don’t miss it! You can also download the poster as a PDF here.